The Vectra Premium Walker, features a contoured liner with a moisture wicking inner layer, along with BREG’s patented Airmesh® material for maximum comfort and breathability. 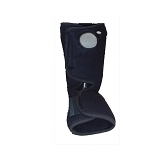 The Vectra Premium’s unique feature, the removable heel clip, which accommodates either closed or open back heel needs/applications. Vectra’s Dual-Axis Rocker bottom encourages a more natural gait, even when the walker is rotated externally during use. Available in five sizes, XS – XL. I was given a plastic splint in ER to wear after I suffered a badly sprained ankle. It didn't offer much support and was causing skin breakdown. I ordered this brace on a Sat and I had it by Tue morning. It made all the difference in the world! I was able to put it on without a PHD, it has so much padding and cushioning that it felt like walking on clouds! I had been using a cane to walk with, prior to the arrival of the brace but I was able to walk without the cane because the boot was so supportive. I've been using the brace for nearly 3 weeks now and I am SO happy that I ordered it, it had just the right amount of compression to keep the swelling down and no issues at all with skin breakdown! Thank you National Brace and Splint!